In a historic summit on June 12, 2018, Donald Trump and Kim Jong Un became the first sitting US and North Korean leaders to meet, shake hands and negotiate to end a decades-old nuclear stand-off. Pictured: U.S. President Donald Trump and North Korea leader Kim Jong Un walk in the Capella Hotel after their working lunch on Sentosa Island on June 12 in Singapore. The faces of U.S. President Donald Trump and North Korean leader Kim Jong Un were first and foremost on North Korea's official party newspaper on Wednesday as state media hailed Tuesday's historic summit between the two men. The North's state media framed Tuesday's summit as a win for Pyongyang as it listed concessions made by Trump, with North Korea dubbing the summit in Singapore "the meeting of the century" on the front page of its official party newspaper. Trump expressed his intention to halt U.S.-South Korea joint military exercises, offer security guarantees to the North and lift sanctions against it as relations improve, according to a report by the Korean Central News Agency (KCNA). Denuclearisation of North Korea was barely mentioned elsewhere in the statement, which mainly focused on stopping hostilities between North Korea and the United States. No mention was made of officially ending the state of war between North and South Korea after their 1950-53 conflict ended in a truce not a peace treaty. 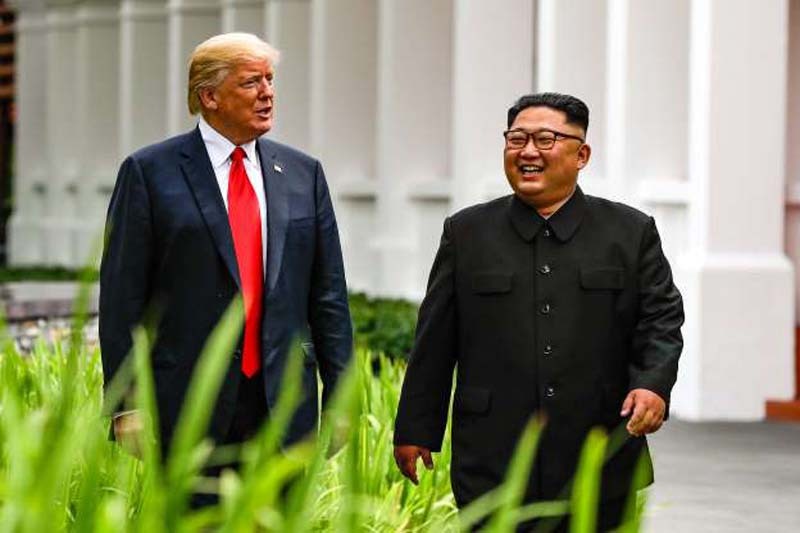 Photographs of Trump and Kim Jong Un crowded the first half of Wednesday's six-page Rodong Sinmun newspaper, the pair in various situations at the summit venue in Singapore. In one photo on the front page, Trump was featured gesturing the way forward for Kim Jong Un, while four of the eight photos on the front page featured them shaking hands. Backdrops of U.S. and North Korean flags, both red white and blue, were also prominent in the Rodong Sinmun, which has previously lashed the United States as a 'gangster-like imperialist', and 'cancer-like entity'. "Today's Rodong Sinmun wants to show Kim Jong Un played a huge part and seized a great victory," said Moon Hong-sik, research fellow at the Institute for National Security Strategy (INSS). "If you look at just the North Korean reports from today it seems this week's summit existed to create a new peace regime on the Korean peninsula and a new relationship with the United States. Denuclearisation was just an appendage," he said. The newspaper had been quick off the mark to cover Kim Jong Un's trip, plastering it's Tuesday edition with pictures and stories of Kim traveling with officials and sightseeing. According to KCNA, Kim Jong Un said it was "urgent" for North Korea and the United States to halt "irritating and hostile military actions against each other" during the talks on Tuesday. Kim and Trump invited each other to their respective countries and both leaders "gladly accepted," KCNA reported. Trump's pledge to end joint exercises with South Korea without explicit concessions from North Korea to lower the military threat posed by Pyongyang took South Korean and U.S. military officials by surprise. "For North Korea, they got exactly what they wanted," Moon Seong-mook, a former South Korean military official and current head of the Unification Strategy Center in Seoul. "They had a summit as a nuclear state with Kim on equal turf with Trump, got the United States to halt joint military exercises with South Korea. It's a win for Kim Jong Un." Moon said the North's report should be confirmed from the U.S. side, while another expert agreed the North Korean state media should be taken with a grain of salt. "It's propaganda in the end," said Jeong Hyung-gon, a research fellow at the Korea Institute for International Economic Policy. "They are expressing their thoughts in order to cover their weaknesses." The 33 photos seen in Wednesday's Rodong Sinmun were far fewer than the 61 featured in the Rodong the day after the April 27 inter-Korean summit but the April event had been a one-day trip for Kim Jong Un while Kim was in Singapore for three.